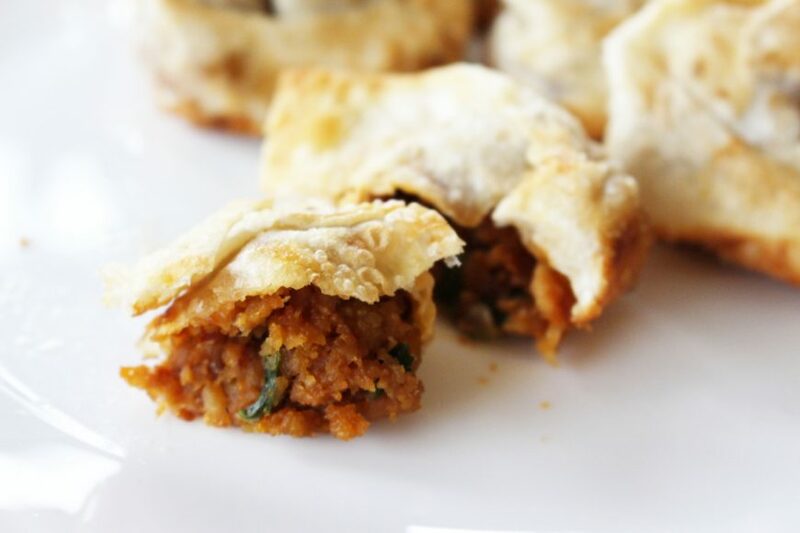 This Recipe Will Have You "Wonton" More! I have a real soft spot for Wontons and Spring Rolls. I make my own spring rolls and no, I won’t share that recipe with you! A girl has to have some secrets! Wontons have made their way into my food loving heart and now I want to share with our favourite meatless Wonton recipe with you. It’s so good, you’ll be “wonton” more! 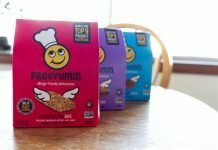 I am not a vegetarian by a long stretch but with amazing meatless alternatives like Cauli Crumble by Big Mountain Foods, you must tell everyone you know! 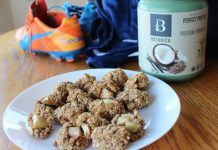 We first tasted this on pizza at the Healthy Family Expo and then again at our Cinco de Mayo inspired party back in May. Needless to say, I cannot get enough of it! This wonton recipe has Cauli Crumble as the main ingredient. I spent weeks attempting to learn how to make the perfect wonton, I was NOT going to release this recipe until they looked picture perfect. After much frustration and countless youtube videos, I realized, they weren’t ever going to look perfect! If you make them too, yours will probably not look perfect either. Rather than rub your face in perfect Wontons, here they are with all their delicious imperfections! Wonton Wrappers, I used square but if you can find round, go with them! This is the easiest cooking I’ve ever done, cook Cauli Crumble as per instructions on packaging. 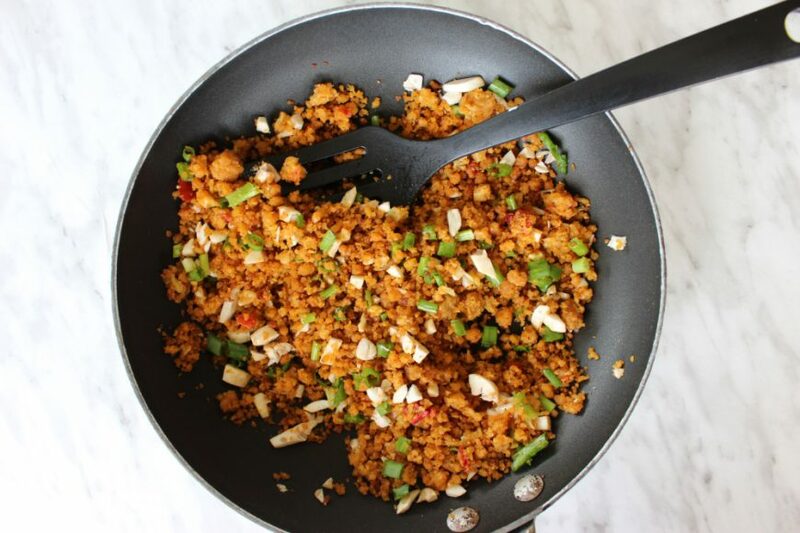 Add White mushrooms and green onions, you can use other veggies should you wish! Slowly stir the sauce into the filling and remove from heat! 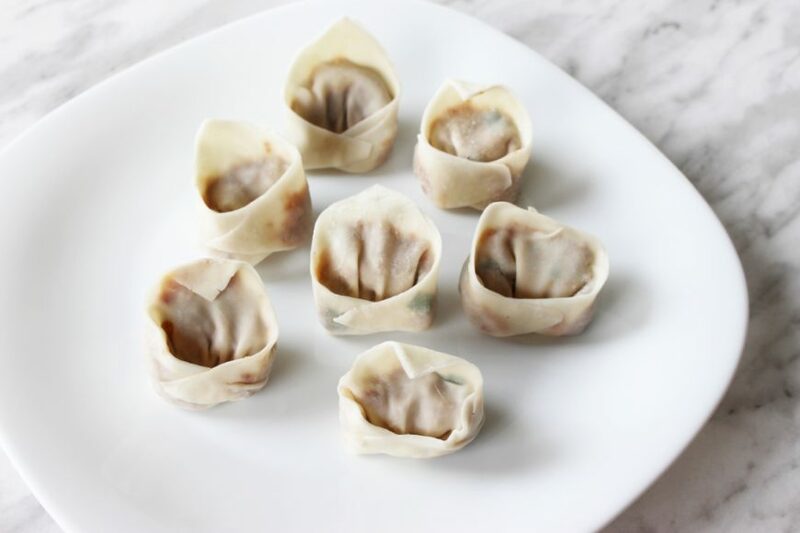 Place a teaspoon of the filling onto a wonton paper, becareful not to leave the wonton papers out on the counter for too long as they will dry out. This is now where I googled the heck out of how to fold the perfect wonton. There is like 7 different ways to fold a Wonton but alas I failed at everyone of them. I basically laid the paper flat like a diamond and folding the one end over to the other creating a triangle shape. I ran it along the inside of the paper and then pinched the edges closed. I brought the two outside corners in together and pinched them closed, again using a wet finger. 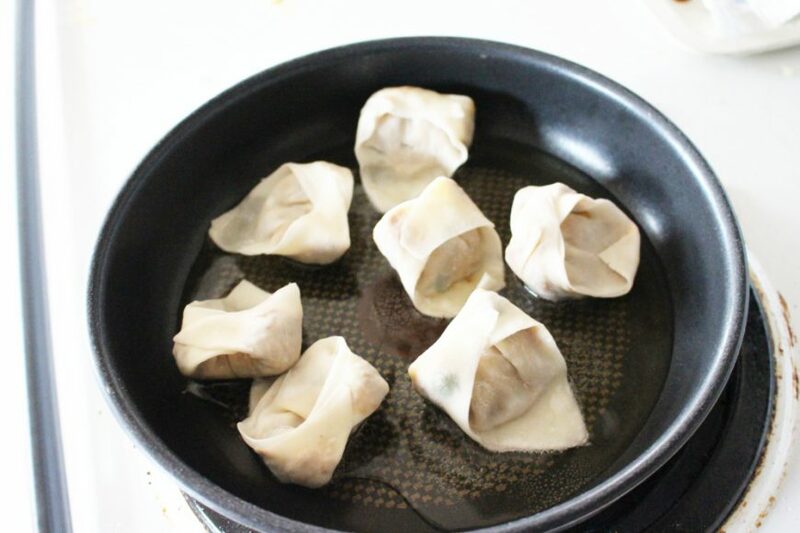 Once you have your wontons completed in a small frying pan with some olive oil.. or my favourite, homemade garlic oil and you have a crunchy delicious, meatless appetizer. You can dip into soya sauce, or you even an oriental dipping sauce like this one I found HERE on AllRecipe.com or if you’re like me, pop a wonton in your mouth as is and let their already flavoured filling and crunchy exterior do the talking! They’re incredibly easy to make and they do freeze well! 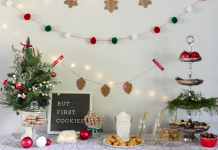 Disclaimer: We received product in exchange for recipe development! 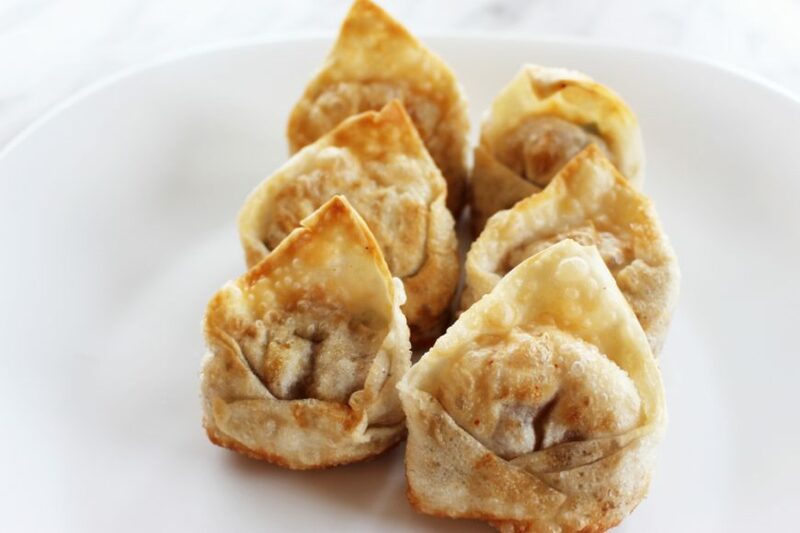 Love wontons and this recipe looks delicious! Those look really good! Thanks for sharing the recipe! This looks so yummy! I love wontons! I’ve only ever had wontons in soup and I wasn’t crazy about it. I wonder if I’d enjoy this, ought to give it a shot! Those look so so good! I’ve never tried to make my own wontons, always thought they’d be too hard! These sure look tasty they really have me wanting more !! Yum yum and yum! This doesn’t seem too hard.